Seven of the very best organic cheeses we’ve tasted. 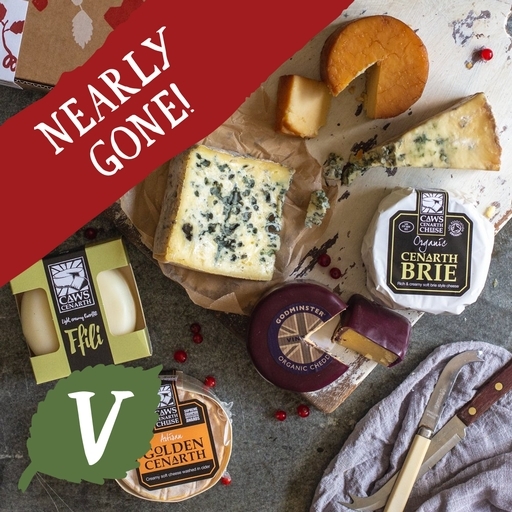 Godminster’s waxed vintage cheddar and vintage smoked cheddar truckles, traditional Welsh caerffili, creamy brie, and gooey Golden Cenarth. To finish the feast, Cropwell Bishop’s superb Stilton and the special blue caerffili Perl Las Blue. All bases covered – a proper Christmas treat! Serves 8+. Keep in the fridge. Best eaten at room temperature. Best before date will be after Christmas Day. The cheese comes from small-scale British organic producers, who make their cheese carefully by hand using traditional methods. Golden cenarth semi-soft cheese: Pasteurised cows milk, sea salt*, vegetarian rennet, cultures*. Godminster vintage smoked cheddar: Pasteurised cows milk, starter cultures, vegetarian rennet, salt* (1.8%). Caws cenarth perl las blue: Pasteurised cows milk, sea salt*, vegetarian rennet, culture, penicillium roqueforti. Godminster vintage cheddar truckle: Pasteurised cows' milk, salt*, cultures, vegetarian rennet. Caws cenarth caerffili: Pasteurised cows milk, vegetarian rennet, sea salt*, milk cultures.